My wife and I have been called to serve 23 months as a Mission Office Couple in the New York New York South Mission. We enter the MTC in Provo, Utah, on March 21st, 2016. Since receiving our call letter, we have been re-reading the missionary guide, Preach My Gospel, where we find the concept of no death before the fall presented as Church doctrine. Preach My Gospel sets forth doctrines that missionaries are expected to study and teach. 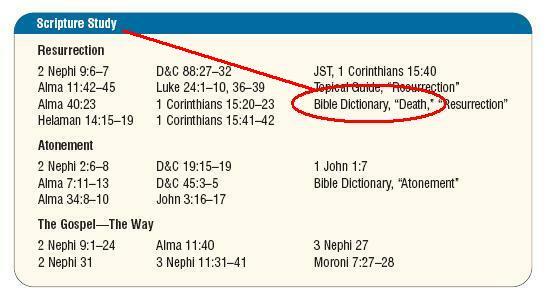 Twenty eight times, missionaries are directed by Preach My Gospel to read and become familiar with ideas found in the LDS Bible Dictionary. "Latter-day revelation teaches that there was no death on this earth for any forms of life before the fall of Adam. Indeed, death entered the world as a direct result of the fall (2 Ne. 2:22; Moses 6:48)." Preach My Gospel directs missionaries (10 times) to read and become familiar with ideas found in the doctrinal guidebook, True to the Faith, which was written specifically for teens, young single adults, and new members. Teachings about no death before the fall found in True to the Faith were discussed in an article posted on this blog May 15, 2005. Congratulations on your new call. May God continue to bless you as you continue to serve with all you heart, might, mind and strength. Just a little picky point. The online version is slightly different from the hardcopy version you quoted. The online version reads: "Latter-day revelation teaches that there was no death on this earth before the Fall of Adam. Indeed, death entered the world as a direct result of the Fall". That is, the words " for any forms of life " were deleted. DavidH: Thank you. We are looking forward to a wonderful couple of years. Regarding the online wording change, it is clear either way that "there was no death on this earth before the Fall of Adam." My guess is that the deleted words were deemed redundant. Good luck and enjoy your missionary service. Congratulations! I bet you'll do great! Congratulations, I hope you have a great experience. If you need to escape the crowds, the north fork of Long Island is a great place to find some peace and quiet.